Democracy and citizenship in action - the School Council is a channel through which all our children feed back to St Bartholomew's with their concerns and ideas. This year, the Council has been working on a number of areas, including the development of the junior playground, helping the school to achieve the Healthy Schools Plus Award and a visit to the Houses of Parliament. 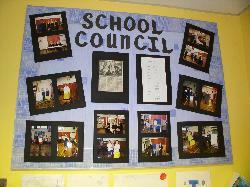 The School Council plays an important role in helping its members develop valuable skills in speaking and listening, teamwork, decision making and problem solving. It has also been greatly successful in helping children to build successful relationships with adults, the wider community, and with their peers.